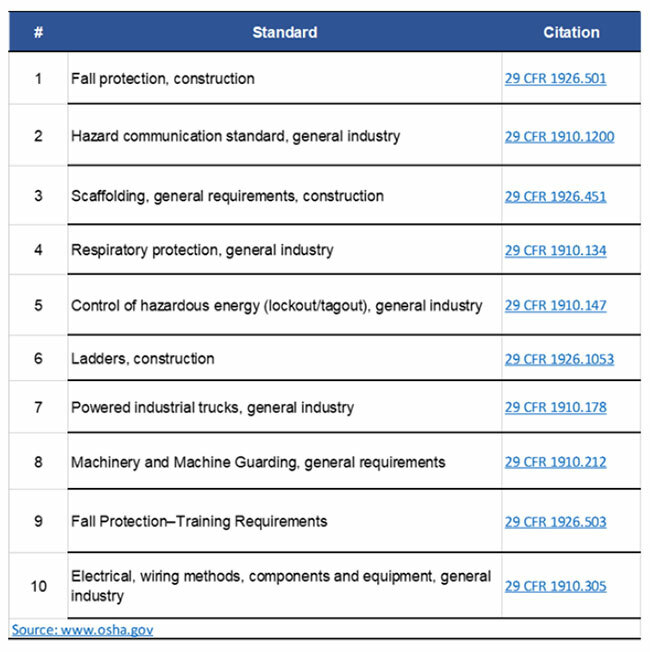 • For the first time, Fall Protection Training Requirements has made OSHA’s Top 10 list of most frequently cited standards. • All workers with exposure to fall hazards must receive training, regardless of age or experience, and must be retrained if previous training is rendered obsolete. • Training and documentation of training are key components of an effective and compliant Fall Prevention Program. New to the Top 10 list is No. 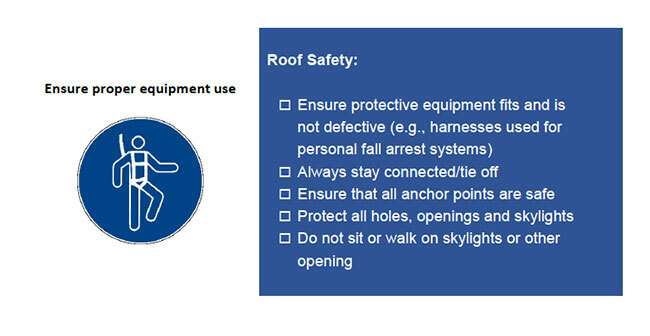 9: Fall Protection – Training Requirements. Per this standard, employers must provide a training program for each employee including potential exposure to fall hazards. This training must include: the nature of fall hazards in the work area(s); procedures for erecting, maintaining, disassembling and inspecting fall protection systems; use and operation of guardrail systems, personal fall arrest systems, safety net systems, warning line systems, safety monitoring systems, controlled access zones, and other protection; role of each employee in the safety monitoring system when this system is used; limitations on the use of mechanical equipment during the performance of roofing work on low-sloped roofs; correct procedures for the handling and storage of equipment and materials and the erection of overhead protection; and role of employees in fall protection plans. Following training, employees must be able to identify fall hazards and safety procedures that minimize fall hazard risks. Proper training is a continual process and retraining may be required. An employee must be retrained any time there is evidence that the individual no longer demonstrate the understanding or skills required to properly identify fall hazards and procedures to minimize fall hazard risks. 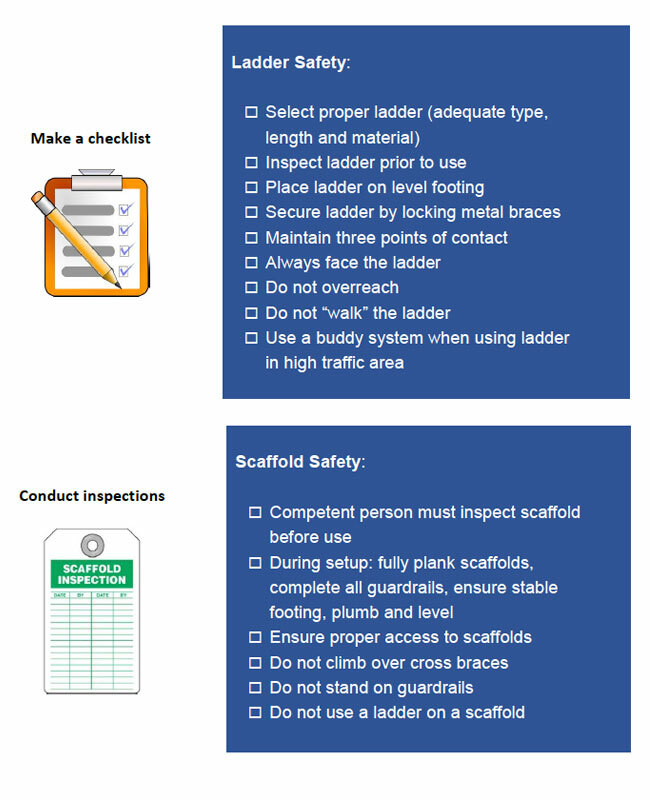 Employers must actively work to recognize inadequacies in an employee’s knowledge and use of fall protection systems or equipment through frequent and periodic inspections and training check-ins. If necessary retraining should occur promptly if knowledge or understanding is not clearly exhibited. Further, changes in the workplace or processes that render previous training obsolete, such as changes in the types of fall protection systems or equipment used, signal the need for retraining. Training plays a significant role in worker safety throughout all industries and sectors. With the increase in an aging workforce in the United States, challenges of training multi-generational staff can be surmounted by careful consideration, implementation and accommodations, if needed. It is the employer’s responsibility to provide training in a manner that is understandable to the employee. 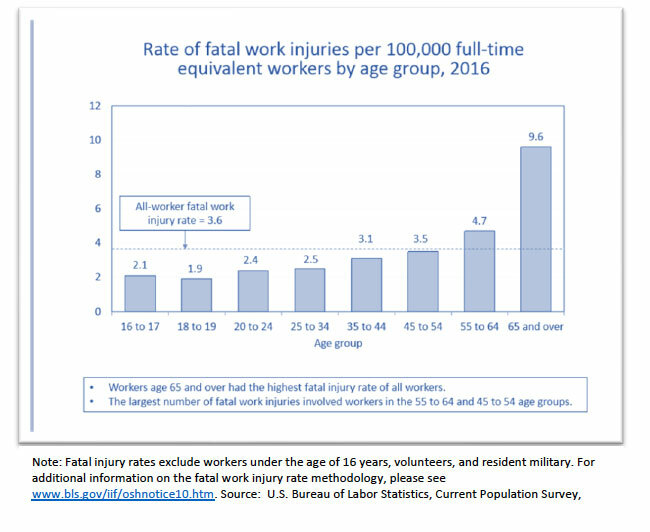 The National Institute for Occupational Safety and Health (NIOSH) reports that young workers have high rates of job-related injury and that limited, or no prior work experience and a lack of safety training contribute to high injury rates.1 Young and new employees in particular may not have enough experience to “know what they don’t know” and may be hesitant to speak up when unsafe acts or conditions arise in the workplace. Providing training upon hire eliminates the guessing game of whether an employee knows how to work safely. The Bureau of Labor Statistics (BLS) reports workers age 65 and over had the highest fatal injury rate of all workers in 2016.2 Consideration for physical fitness of employees is an important part of training, retraining and evaluation of the worker. A common challenge in training older or experienced workers is introducing changes or new procedures. If an experienced worker is set in his or her ways and does not want to adopt safe work practices as outlined in the safety training, it is the responsibility of the employer to ensure the training content is not only provided but implemented and enforced. Training a worker to do one thing but allowing him or her to do another does not constitute providing a safe work environment. Retraining must be provided to workers who fail to follow procedures – whether intentionally or not. A company’s safety culture is strengthened when all employees are held to the same standard for safety policies regardless of age or experience. Records of training must be kept on file including the names of employees trained, dates of training, and signature of trainer. Documentation may be in hard copy or electronic form. Periodic review of recordkeeping documents allows employers to certify compliance with training requirements as laid out in the Fall Protection standard. Documentation is a powerful tool in the evaluation of a company’s Fall Prevention Program as a whole. Consider the following criteria for evaluation: incident reporting and root cause analysis; periodic on-site audits; review of training documentation; and employee feedback and interviews. Reviewing documentation of incident reports, inspections and training records can reveal deficiencies in the program and allow management to implement necessary changes for continual improvement. Soliciting feedback from workers at all levels encourages employee engagement in safety. In summary, developing a Fall Prevention Program, posting fall hazard signs in the workplace and making protective equipment (such as harnesses and lanyards) available to employees alone is not enough. Training is a key component to ensuring employees understand and follow all elements of the program. As evidenced by its presence on OSHA’s Top 10 list of commonly cited standard for 2017, fall protection training requirements are under increasing scrutiny. Is your program compliant?